However after doing a 5 day trial I felt it was definitely worth writing an update on the results I am seeing and the research available on the subject. “Research on milk of the one-humped camel has been done in greater detail than thatof the two-humped camel (Yagil & van Creveld, 2000).Dromedary milk is pure white as the fats are finely homogenized throughout the milk; the milk is low fat -2% (Yagil, 1985) and the fats consist mainly of PUFAs – longchained poly unsaturated fatty acids (Abu-Lehiya, 1987); it has a relatively low pH(Yagil et al, 1984) probably caused by the high concentrations of ascorbic acid -vitamin C (Yagil, 1985; Farah, 1996); proteins are present at 3.2% but lack theALLERGENIC !beta lactoglobulin and have a different, “new” beta casein (Beg etal, 1986); there are bacteriostatic and viricide activities of the milk (Barbour et al,1984; El-Agamy et al, 1993); lactose appears in similar percentages to cow milk but lactose intolerant people do not exhibit the typical signs after drinking camel milk(Jack Hanna’s Animal Adventures). Camel milk has high concentrations of calcium and iron so the low pH of the milk(from the ascorbic acid – vitamin C) allows enhanced absorption from the duodenum. concentration of insulin given as rabbit units. (c) Streptozotocin induced diabetes in rats was controlled and cured with camel milk. (d) Although human, cow and goat milk contain insulin, it is degraded in the acidenvironment of the stomach. This does not occur with camel milk which does notreact to acid (Abu-Lehiya, 1989) and no coagulum is formed. Personal observation in a calf which died 2 hours after suckling: no coagulum was present in stomach although it was filled with milk. Camel milk contains various protective proteins, mainly enzymes which exert antibacterial and immunological properties (Kappeler, 1998). • participates in primary immune system, which is based on targeting ofstructures common to invading pathogens. • These give the immune protection to the body against infections. • iron-saturated lactoferrin (from second week lactation) prevents microbial growth in gut. • participates in primary immune system, which is based on targeting of structures common to invading pathogens. • Camelid milk apparently contains much more lactoferrin than in ruminant (cow, sheep and goat) milk (Morin et al, 1995). • lactoperoxidase is found in milk, tears and saliva. It contributes to the nonimmune host defense system. • exerting bactericidal activity, mainly on gram-negative bacteria. • has growth promotion activity. • has anti-tumor activity (Ueda et al, 1997). • has a close relation (71%) to human thyroid peroxidase, which is involved in iodination and coupling in the formation of the thyroid hormones. • the highest concentrations of this enzyme is in camel milk. • has apparent effect on breast cancer (Kiselev et al, 1998) by controlling metastasis (Kustikova et al, 1996). (Abdurahman, 1995). However after checking milk of hundreds of camels (Chaffer et al, in Press) and llamas (Morin et al, 1995) all with high NAGase levels another conclusion was reached. It was concluded that NAGase has an antibacterial activity and so strengthens the antibacterial-antiviral activity of the milk. It is noteworthy that the NAGase activity is similar to that in women’s milk, confirming the nutritional advantages of camel milk over cow milk. In India a comparison between conventionally treated juvenile diabetes with those also drinking camel milk showed that the group drinking the milk had significantly reduced blood sugar and reduced HbA1C levels (Agrawal et al, 2002). The amounts of injected insulin were also significantly reduced. In Israel diabetics drinking camel milk showed similar results as in the clinical trials. A case in particular was a young girl who started drinking camel milk within 2 weeks of the diagnosis of IDDM. After 8 weeks she was getting minimal dose of insulin while blood sugar declined to 80mg% and HbA1C to 7. IT IS NOTEWORTHY THAT HYPOGLYCEMIA IS A COMMON FINDING WITH THE MILK, PROBABLY DUE TO THE REDUCED FEEDBACK OF GLYCOGEN. The fact that camel milk lacks lack β−lactoglobulin and a “new” β−-casein (Beg et al, 1986), two powerful allergens in cow milk, makes the milk attractive for children suffering from milk allergies (Makinen-Kijunen & Palosvo, 1992). 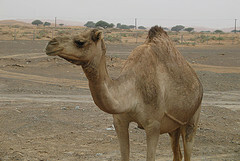 Phylogenetic differences could be responsible for the failed recognition of camels’ proteins by circulating IgEs and monoclonal antibodies (Restani et al, 1999). Children with severe food allergies improved rapidly with camel milk. Crohn’s Disease: Crohn’s disease is becoming an epidemic in many countries. Lately increasing evidence points to a primary bacterial infection by Mycobacterium avium – subspecies: paratuberculosis (MAP). This mycobacterium could spread via cow milk as it is unaffected by pasteurization. IT IS POSIBLE TO GET MORE INFORMATION FROM THE INTERNET BY SEARCHING “PARATUBERCULOSIS”. Apparently MAP enters the mucosa as saprophytes and only become active when the person is in severe stress, leading to a secondary autoimmune response. As the bacteria belongs to the family of tuberculosis and as camel milk has been used to treat tuberculosis (Urazakov & Bainazarov, 1974,) it becomes apparent that the powerful bactericide properties of camel milk combined with PGRP havea quick and positive effect on the healing process. In addition, immunoglobulins attack the anti-DNA and restore the immune system. Autism: As a malfunction of the immune system causes an alimentary enzyme inhibition, causing the breakdown of casein, not to aminoacids, but to casomorphine. The casomorphine is a powerful opioid, much more potent than morphine itself. Autistic children drinking camel milk have had amazingimprovements in their behavior and diets. He has been given about 300 ml of Camel Milk per day for the last 5 days in 3 divided doses. The brand I used came from a Dubai Supermarket called Camelait. It came pasteurised, but I have not heated it and it has been stored in the refrigerator. The beneficial effects of Camel Milk are pretty rapidly observable…and so have put them down in this note…however it will be interesting to see whether they persist even when I run out of Camel Milk which is going to be the day after tomorrow!!!! I give below a variety of links to studies and blogs on the subject for those who wish to find out more. For local Indian sources of camel milk…get in touch with me!!!!! This entry was posted in Biomedical, Camel milk, Diets-GFCF and tagged Autism, Camel milk. Bookmark the permalink. I’m very intrigued with the possibilities camel milk presents for healing. My daughter is going through an autism assessment now and will likely receive a diagnosis of PDD-NOS. We are starting her on camel milk next week and I am very excited to see if we notice improvements. My Son is allergic to milk and we are on strict GFCF diet. Is Camel milk suitable for my Son considering his milk intolerance? Very interesting article….thank you for the information. We live in USA. Where are you located? How would we get Camel milk here if we wish to give it a try for our daughter? Thank you!! I have given the link to the facebook group in the article. There are camel farms in the US. You will need to join the group and post your requirement and interact through email with the farms directly. hi would like to know that where can i get camel milk in u.s.a. please help me to find out………. I will look it up there thanks! WHY CAMEL MILK IS ILLEGAL IN US? THE FOOD AND DRUG ADMIN JUST WANT US TO STAY SICK SO WE CAN KEEP TAKING MEDS FOR THE REST OF OUR LIVES. DONT TRUST DOCTORS, THEY MAKE U MORE SICK, THEY JUST SUPPRESS SYMPTOMS AND NOT HEAL THE DISEASE AND WANT TO MAKE BIG MONEY. how are things now the the camel milk? its now Feb of 2012.. and wondered if it was still being used and today..was it worth the time? How does camel milk taste like? Is it similar to cow milk? PLEASE EMAIL ME, BECAUSE I WANT USE FOR MY SON. hi we buy pateurised camel milk.and we stay in dubai..i have a doubt if i can have camel milk coz am pregnant. will freezing camels milk effect the healing properties?